Penkridge is the largest village in St Mary’s Parish. We celebrate Mass each Sunday at 9 a.m. at the Parish Church of St Michael and All Angels and are welcomed there by the Anglican Communion. It is a well-attended Mass and has a Children’s Liturgy that is led and supported by parents. After Mass as the people are going out we meet the Anglicans coming in for their 10.30 service. We spend as much time talking to them as we do mixing with each other! This is in keeping with the many things we do together. We have a number of religious events throughout the year, like the Week of Prayer for Christian Unity, the Women’s World Day of Prayer and the afternoon of Prayer and Praise at Pentecost. And we are represented at the Churches Together Committee Meeting held usually at the Methodist Centre. We also work together on a social level. People from both Churches help out on the Voluntary Car Scheme, others attend and help out at the “Drop In Centre” every Wednesday, and the musicians from both Churches get together from time to time to make music. HCPT is a national organisation and registered charity. It has a local group, Group 16, which takes children with special needs to Lourdes for a week each year. It is led by Penkridge people and supported by our parish. We hold Car Boot and Table Top sales to raise money for the charity and people are very generous in their support. One stall holder on Penkridge Market has let us use his stall during the close season to sell donated goods. The Helpers Group that meets six times a year consists of Catholics, but the people we help in a practical way can be from any Church, or none. 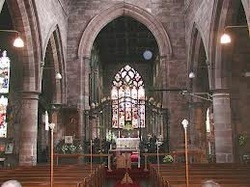 Our ministry is to serve the people of Penkridge as well as contributing to the parish life of St Mary's in Brewood.